G.E. 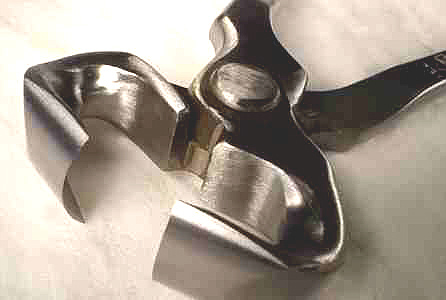 Half-Round Nippers start from drop-forged chrome vanadium steel and are precision machined to obtain the correct bevel to the cutting edge. Extensive time is put into each nipper by G.E.’s skilled craftsmen in the alignment and sharpening of the nipper. Designed originally for use in hoof wall work and clip placement, G.E. Half-Round Nipper is excellent for reaching those hard-to-get-at places in the hoof. They are a tool that makes shoeing so much easier, especially if you fit clipped shoes cold or have thick soled horses. *Be careful when using half rounds as they may cut deeper than you intend. Practice on a real thick hoof or sole if you have not used half rounds before.